Stromness Community Garden were the recent winners of a competition to host a fully funded permaculture design course, taking place in August. The subsidy will enable them to bring education in permaculture and practical sustainability to one of the most remote areas of Scotland, but one which is rich in both creative local folk and natural resources, on land and at sea. Black Isle Permaculture and Arts - otherwise known as Clive Brandon and Julie Plumridge, have sent us their 2018 newsletter summarising the wide range of their activities during last year. To say it was obviously a busy year would be a considerable understatement. See also an interesting blog by Julie Deconchat in which, after writing favorably about a visit to Clive and Julie, she suggests the Permaculture movement may be 'undermining its potential', by representing individual attitudes and initiatives as appropriate responses to issues of sustainability, while failing to give sufficient attention to the systemic and structural problem of intensive industrial agriculture. Terra preta (. . . literally "black soil" in Portuguese) is a type of very dark, fertile manmade (anthropogenic) soil found in the Amazon Basin. It is also known as "Amazonian dark earth" or "Indian black earth". In Portuguese its full name is terra preta do índio or terra preta de índio ("black soil of the Indian", "Indians' black earth"). This item was prompted by an email from Graeme Mochrie in relation to the TBI 2017 film programme, suggesting that TBI members might be interested in a German film on this fascinating subject. There is a comprehensive article on terra preta on the Permaculture Research Institute website. By following the ethics and principles of Permaculture we can create robust, diverse communities geared towards enhancing the natural environment. Permaculture is an umbrella term used to describe the development of ‘permanent cultures and systems’ which relate to both agriculture and wider human behaviours. It is not simply organic gardening, or a low cost carbon saving initiative. The theory of Permaculture underpins the ideas behind the Transition Town projects. Permaculture is a worldwide, grassroots movement. People from all walks of life are using Permaculture techniques and principles, employing both ancient and modern practices in farming, fishing, building, economic activities and resource management. It encourages responsibility of the individual, empowering change at a personal level and community level. This section of the Transition Black Isle website will give you some basic information on the core ethics and principles as well as practical techniques used to produce food, enhance soils and also projects to try at home. At the heart of permaculture is the understanding of its ethics and principles. The ethics are the care of the Earth, care of people and fair sharing. 1) By caring for the Earth and its inhabitants, we can enable the cycles of life to continue without disrupting it with our economic and social activities. We only have one planet to live upon. 2) Caring for people means we enable a greater connection to our personal relationships and wider communities. Ties are strengthened and we become more resilient when we work together. 3) Finally by fairly sharing our resources, trading ethically and look beyond monetary values we can develop a sustainable system to live within. This can also applies to sharing the Earth with other species. 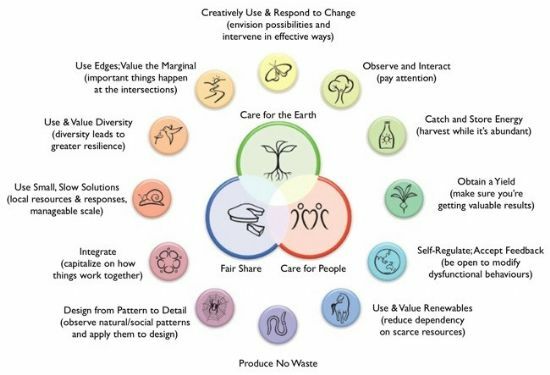 These are the methodical aspects of Permaculture. They give indications of how best to act, not the specifics of how to implement them. They should play a role in all your practical activities and really gives weight to why people practice this method of cultivation and being. In practical terms, a Permaculture approach would make the best possible use of resources, location, and aspect while reducing energy needs/costs and impact on the environment. Here is a brief insight into three areas of Permaculture that go beyond simple food production, and start to apply some the principles to a site. The picture below on the left shows the concept of Permaculture zones; the picture on the right is how it could then be implemented in your home garden. 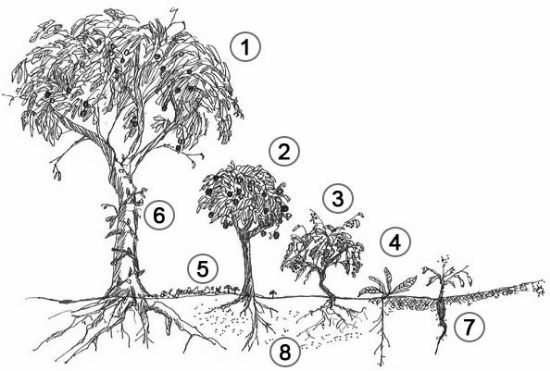 The idea of zones is a key part of Permaculture design. It gives an insight into how a site is used, and where elements such as livestock, orchards and planting are best situated. Zones are designated areas but they don’t necessarily have boarders, and should be arranged to increase efficiency. 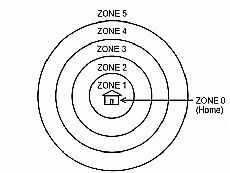 As a rough guide, Zone 0 is the home or main focal point if no house is present. 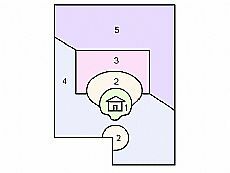 Zone 1 contains elements needing daily attention/access like kitchen gardens, compost and salad leaves. Zone 2 is more intensive production like green houses, poly tunnels and animals such as chickens. Zone 3 is about larger live stock in paddocks, bulk vegetable production and fruit and nut trees that require little intervention. Zone 4 is woodland production for coppice and timber products, and zone 5 is left alone to become/remain wild and is unmanaged. Zone 5 can be seen as unproductive by some, but only by integrating space for nature can we truly behave in sustainable ways. 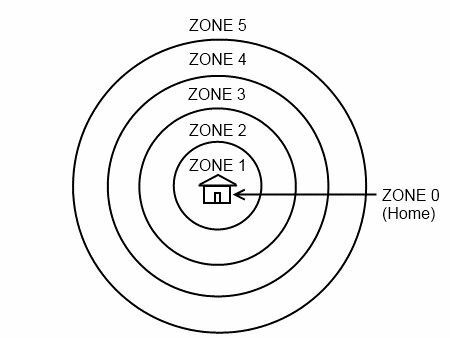 So if Zone 0 is the starting point, zone 1 is everyday access, zone 2 is every other day, zone 3 once a week or so, zone 4 is perhaps once a month or harvest times only, and zone 5 is visited only as an observer. Working from a zone perspective, you will automatically reduce the amount of time and energy used on completing tasks in the garden/homestead. One of the principles of Permaculture is the use of ‘edge’ in your food production and nature gardens. Its usage can have significant benefits, increases of yield and create greater surface areas between systems. It is best described as the overlap of adjacent ecologies. For example, areas of interchange between water and grassland, or grassland and trees create greater numbers of species and diversity than blocks of specific ecologies. This can be clearly seen in riparian areas and woodland edges when out walking or when tending gardens. 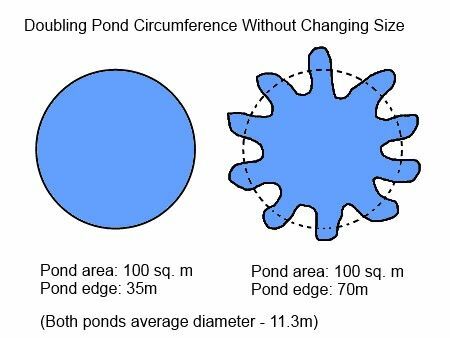 Here is an example of how to increase the edge of a pond, without increasing its overall area size. By doubling the edge, you create twice as much area for plants and species that use that margin between the two ecologies. In areas where pioneer species grow and are left alone, eventually they create the base conditions for a climatic forest to follow. A food forest or forest gardening is working on the principle of substituting certain plants and species for food production. It moves with the natural progression of a forest system, from ground covering pioneer plants to climax tree. The food forest is a sustainable way of producing food, modelled on natural woodlands. This becomes a living ecosystem that once established, requires little intervention from humans but provides us with a yield of food and produce. 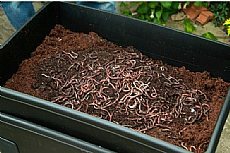 It has little requirements for pest control, watering or digging. These are all great examples of how adopting a Permaculture approach can benefit you and your environment. By understanding zones we can become more efficient and waste less time and resources, by increasing edge we also create greater opportunities for diversity, and by implementing a food forest we can work with nature’s patterns while gaining a yield. Forest garden design example .